ustralia has bought the first of six U.S.-manufactured long-range drones that will cost 6.9 billion Australian dollars ($5.1 billion) and significantly increase the nation’s military surveillance and reconnaissance capabilities, a government minister said Tuesday. 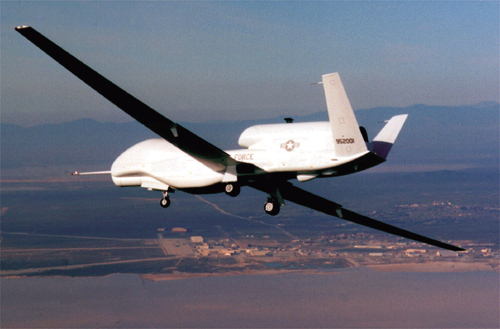 The first MQ-4C Triton was purchased from Northrop Grumman for AU$1.4 billion ($1 billion), Defense Industry Minister Christopher Pyne told Parliament. Australia’s most important contributions to “Five Eyes” — an intelligence gathering network that includes the United States, Britain, Canada and New Zealand — were reconnaissance and surveillance over Southeast Asia and Antarctica, as well as the Indian and Pacific oceans. The Tritons will operate with 12 manned P-8 Poseidon surveillance planes that are replacing the aging P-3 Orion aircraft, he said.